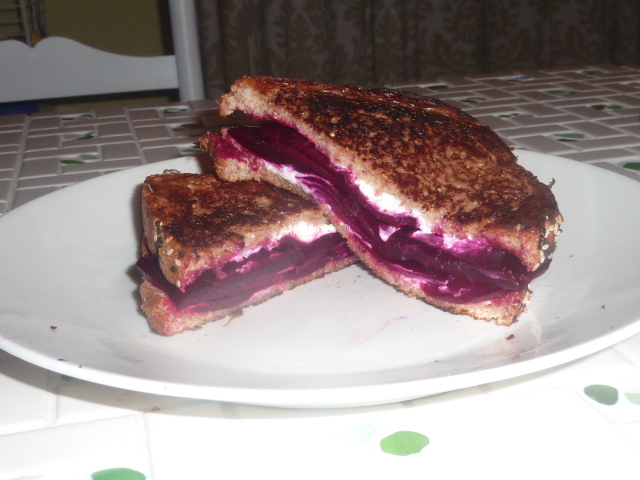 If you like goat cheese and you like beets, you will looooooovvvvvvve this sandwich. It is simple, delicious, and super easy. The earthy sweetness of the roasted beets pairs perfectly with the goat cheese and the balsamic vinegar lends the perfect bite. We’re beet freaks in this house, so I serious upped the beets from the original recipe at Chow. To cut down on the cholesterol, I also reduced the amount of the goat cheese and used Brummel & Brown rather than real butter. It was absolutely delightful and pretty much guilt-free. Roll out two large sheets of tinfoil (about six inches long) and place them on top of one another. Place beets on center of sheet and drizzle with 1 tbs. of olive oil, making sure beets are evenly coated. Season with kosher salt and freshly cracked black pepper. Create a tinfoil packet for the beets by folding the top layer of tinfoil lengthwise, folding the edges over, and crimping. Repeat with the bottom layer of tinfoil. Just in case, place on a baking sheet to catch drippings. Place beet package in oven and roast roughly one hour. When cooked, a knife will be easily inserted into the largest part of the beet. When beet is fully cooked, remove tinfoil packet from oven and carefully open (there will be steam, so watch out). Once cool enough to handle, slip off skin of beet. You may want to use a pair of latex gloves to avoid staining your fingers. Using a mandolin or knife, cut into 1/8″ slices. In a small bowl, mix together beet slices, balsamic vinegar, kosher salt, and freshly cracked black pepper. Let sit 10-15 minutes (beets should absorb the vinegar). Butter both sides of all slices of bread with Brummel & Brown. Crumble 1 1/2 tbs. of cheese over 2 slices of bread. Top each slice with half of roasted beets, crumble half of remaining cheese over roasted beets. Top with remaining slice of bread. Melt remaining Brummel & Brown in a large cast iron skillet over medium-high heat. Add sandwiches and cook 4-5 minutes per side until golden brown, heated through, and cheese is melted. Cut each sandwich in half and serve.